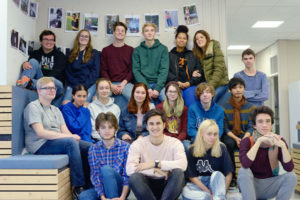 ISUtrecht offers a range of IB Diploma Programme subjects. Diploma students all choose one subject from each group 1-5. In addition, students may choose to take Visual Arts in group 6, or choose a 6th subject from groups 3, or 4. Students must choose to study 3 subjects at Higher Level (HL) and 3 subjects at Standard Level (SL). Language and Literature is a language at near first language level and at least six years of study is required for a strong linguist to reach this level; Language Acquisition is a foreign language course requiring 2-5 years prior study. It is possible for a student to take 2 group 1 languages in lieu of a group 2 language. For more information please view the ISUtrecht Language Policy. Student choices should be informed based on their wishes for study at university. Students need to take into account the language the university course is assessed in and the university subject specific admissions requirements. Universities will have an admissions section, which specifies course requirements from the IB Diploma Programme. If this cannot be found you can speak to your DP coordinator, or contact the university directly. ISUtrecht offers Pamoja courses as a group 3 option. Pamoja is an enterprise authorised to deliver online DP courses. For more information on Pamoja, please view Diploma Programme Online and Pamoja Education. Pamoja works in close collaboration with the IB to develop an innovative curriculum using an online learning environment. Students who wish to take a Pamoja course at ISUtrecht must show a strong enthusiasm for the course of study, motivation to succeed and their ability to work independently. Students who are studying for a Pamoja course, will be supported by an in-house coordinator.